The news reaching us now is about Nigerian Army recruitment 2019 Form. We’re using this medium to give you all useful guidelines in how to apply for 2019 army form. Kindly calm down and read the guide below. We’ve listed the application guidelines on this page, not just that, we have also included information regarding Nigerian army past questions and how to get it. 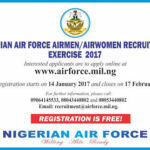 Still on this guide, you’ll also get to know Nigerian army application registration form closing date. 2 How to Apply For Nigerian Army Recruitment 2019/2020? You’re expected to have a minimum of 4 credits in not more than 2 sittings in WASSCE/GCE/NECO/NABTEB. English language is a compulsory subject. In respect to the age requirements, you’re to be between 18-22 years if you’re applying for Non-Tradesmen & Women by March 1, 2018. If you’re registering for Tradesmen or tradeswomen position, then you must be between 18 – 26 years by March 1, 2018. Applicants must print their completed online forms. After printing, attest it and submit it at the examination recruitment centres. You will submit the forms during your screening exercise period. If you have good knowledge of other Nigerian languages then you’ll have good chances too. How to Apply For Nigerian Army Recruitment 2019/2020? Note: Online application ends on January 2019. Screening of all successful shortlisted candidates will commence soon. Kindly note that Nigeria army 78rri recruitment form is out. You will only be allowed to register only when the application form is online. You have to also note that application form is free of charge. Thanks for reading this job guide about Nigerian Army Recruitment 2019/2020. Kindly visit Nigerian Army Job Portal at Recruitment.army.mil.ng. i want to be a Nigeria army. Am interested of army, and i will died for my country Nigeria,i love my country. My name is Kareem,i will be much glad if I could be notify as soon as the 77rri is out..please sir am waiting for the day, thanks .. Notify me when the 2018/2019 army form comes out.thanks. AM DENIS DANLADI BY NAME, I WILL B TOMORROW. I’m interested, ever willing. Please notify me. and i also have the zeal to become nigeria army, sir am good to Go. I will be sucesesfull in jesus name amen. thank u sir.? please am interested for the Nigeria army form. so please notify me when the form is out. thank you. Please do inform me of news about the Nigeria Army 78rri recruitment, and any related recruitment. Inform me, if the form is out. Please! Notify Me When Next Army, Navy, Or Airforce Forms Are Out, Am Interested In Joining One. sir I’m Felix iornem I like Nigerian army and I want to apply for it, please sir notify me when the form is out I will be glad!! I am prepared and waiting for the form. can I be notified when it is out Sir? pls, do notify me when the form comes out. I need to know the next update of nigerian army rri recruitment. I love nigeria Army and by God grace i shall be one of then. plz tell me when the form will be out I’m interested. Pls Update me i’m interested… thanks. please notify me when the Nigeria Army recruitment form is out. please help me. am really interested. I pray that God will help Nigeria’s soldiers to stand and defend our country in Jesus name Amen!!! Good evening sir. I am Asan Nicholas Akura, I sincerely wish to join the Nigerian Army for this 77 (RRI) regular recruit intake, if my request is been granted i will be glad… Thank you for your understanding, am looking forward for your recommendation. I am whating the day. Mr Adukwu good morning,Abbakar from kebbi state. I will be excited,happy,joy,glad,if I was noticed that the shortlist is in progress from today till further notice. please sir I had that they have postponed the screening date….. please when are they announcing the new date…..??? please I need the job… I don’t want to miss the date sir…. Sir wen is the next form coming out pls am interested. please, still up to now I don’t understand what is exert date of shortlist, as well as screening exercise? please some one should tell me. Am good to serve Nigeria as Nigerian Army. am happy to see you in reply sir. I have apply already, now am waiting for call. please remind me the date of calling sir. Pls if I can run to the nearest town and apply some one should tell me now pls. No musa Isah the form has close. Pls is the form still online am in the village an I really love this force pls any help. Jackson the exam date is not yet out. please when can we expect the new date for 77RRI NA zonal state screening. Some says is on 6/4/2018 is that truth? please when when will the date for the screening be out? because if I check my own’ is showing me postpone till further notice. Yes it has already postpone is generaly just be patient they will soon finally shortlist it ok thanks. They said the list is out but no update for my side is anybody with a good news? Please when will the shorlisted name will be out? The same complain Ogunlana is complain happen to me also. Wat is the next step?please. Sir,i was trying to checked if i was shortlisted for Nigeria army but when i was doing that the information i received was that the selection process is ongoing.based on the above what is the next step to take. Please Sir, i apply for nigerian army 77rri and the names of shotlisted candidates is out, may i see the list for if i am one among. Pls is the form still on? And I have e8 in my English pls any hope? Please for God sake i have little problem i apply for Nigerian Army but the person that register my national id card did a mistake please anything u can do to help me may Allah the most beneficient and the most merciful help you too please i really love this force and this is my last hope please i beg you sir. Please, I’m really interested in joining the military Force, kindly update me when the new form is out online. Thanks. Please i will like to known which day the shortlist is going to be out? I fill the form in another state do I have to go to my state of origin for the exams? I will be 35 by March, can I still apply?